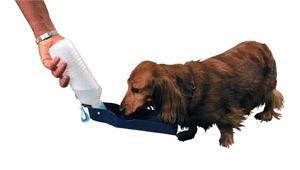 This Dog Drinking Bottle is a practical water dispenser when travelling, hiking, inline skating or on long walks. Just fill the bottle with water and screw the bowl with lid onto the bottle. That way nothing will run out and the water stays clean. When you want to offer your dog some water simply pull up the bottle until it appears a slightly clicking sound. The drinking bottle has a hook so that it e.g. can be fastened easily to the dog’s lead or you can use the included shoulder strap. That way you will not be disturbed or cut down in your activities.